Many of us have witnessed slices of paradise polluted with plastics. Be it lush green valleys, rivers through the jungle, or tropical beaches that have been neglected and trashed. It is overwhelming. How do we help? What is a solution to this trash? Whilst in Fiji, I had the opportunity to test out a bit of fascinating technology that actually converts these plastics into useable oil. If we could recycle plastic found on beaches and in landfills into fuel, perhaps trash would take on more value and not be left to swarm our slowly strangled planet. My host Adrian, of Ocean Ambassadors, has a table-top size Blest Be-h Plastic to Fuel gasifier machine. He crowdfunded for this Japan-made bad boy a few years back to demonstrate the power of valuing beach trash ie. plastics, ability to micro-produce fuel, and the need for closed loop recycling programs in the islands. Not only is it shack-size, but this machine prefers the worst plastics! Chip bags, plastic wrappers, thin filmy plastics that are not accepted in any recycling program. Specifically, those labeled with # 2, 4, 5, 6 and some 7. Generally, recyclable plastics are polypropylene (PP), polyethylene (PE) and polystyrene (PS); but each brews a different mixed oil. Polystyrene works in this system, but does not contain gasoline, kerosene, or diesel equivalent; it should be treated separately and can be used as an assistant fuel. PET, what most plastic bottles are made from, is avoided. PET converts to oil at 600 degrees celsius, but the max temperature for the Be-h is 450 degrees. In this heat PET actually sublimates, so it goes from solid to gas to solid, skipping the liquid oil phase all together. This makes including it problematic and messy. PVC is also steered clear of, as gasification produces Hydrogen chloride and Dioxhin. (http://www.blest.co.jp/) Generally, all was fair game except plastic bottles & styrofoam. 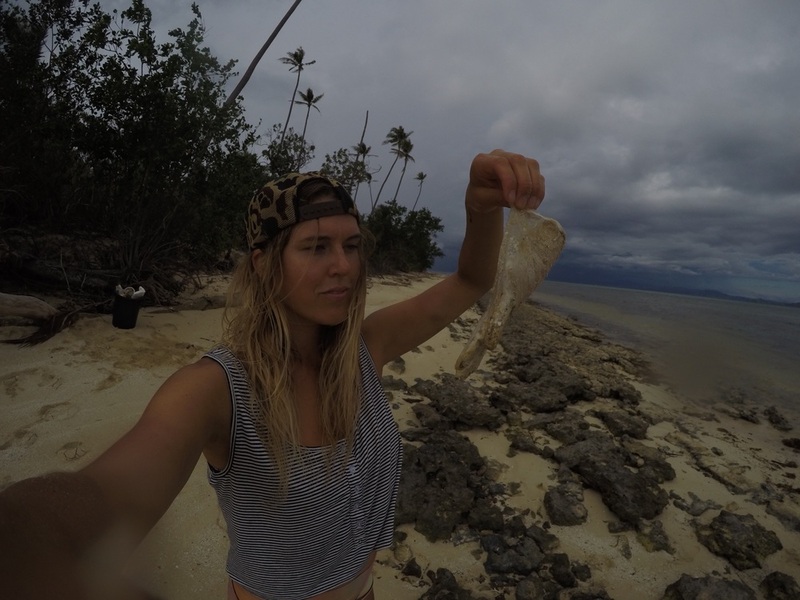 A large storm was coming, so instead of heading to a beach that cops all the mainland trash, we went to the leeward facing side of Malolo island to extract as much plastic as would fit in our bins. Much of the trash had been there a while, it was embedded in the sand or stuck under tree roots. This stuff does not go away! Often when we do beach cleans in other countries we try our best to ensure the trash collected is disposed of responsibly, but there is nothing like holding trash that I was about to personally recycle into a useable material! We headed back to the shack where I sorted the plastics and cleaned them. The furnace in the gasifier heats up to 420 degrees celsius, so if any sand is left on the plastics it would form glass. Fortunately I had found a toothbrush in the cleanup which made scrubbing out bits of sand a breeze. Once dry, the plastics were chopped into smaller bits and shoved into the furnace. The lid was screwed on tight and the touch screen walked us through ten safety checks before beginning the three hour gasification process. Once the plastic reaches boiling point (420), the gases then travel through a pipe into an adjoining container of water where it condenses into oil. Gradually a thin film began to form on top of the water, which had turned a brown colour. Since there is no combustion, no toxins should be released in the process. However, it's likely a few contaminants may slip in. These may show up in the water, visible by change in colour; otherwise, any noxious gases that are produced rise through a pipe connected to the water tank into a charcoal filter. The thin film becomes a thick layer of oil, our very own richly toxic molasses. Once the three hours is up, we let it cool and then drain the oil from the upper valve. Now we have a crude oil made from our beach clean plastics! A kilogram of plastic turns into about a litre of oil. It takes about 1 kW of electricity for the process. This oil can be burned as is to fuel things like generators or stoves. Or it could be further separated (by the Be-h) into gasoline, diesel, or kerosene. Let's be real, if we are going to burn this oil, we will be polluting. Additionally, there were a few chem-y smells floating about and I’m not entirely sure where to dump the brown water, so this process is definitely not getting the "Mermaid Approved" stamp. However, it does show that plastic is a resource that should be valued and not left to line the streets and sand. Once we stop treating trash as trash, and instead treat it as a commodity, it will no longer pile up polluting paradise. It will shine with potential, showing it's value as one step away from powering a vehicle or heating a house. The gasifier may not be a perfect fix, but this experience certainly gives me great hope for our oceans!